The International Semantic Web Conference (ISWC) is the premier international forum where Semantic Web / Linked Data researchers, practitioners, and industry specialists come together to discuss, advance, and shape the future of semantic technologies on the web, within enterprises and in the context of the public institution. We are very pleased to announce that we got 3 papers accepted at ISWC 2018 for presentation at the main conference. Additionally, we also had 5 Posters/Demo papers accepted. Furthermore, we are very happy to announce that we won the Best Demo Award for the WebVOWLEditor: “WebVOWL Editor: Device-Independent Visual Ontology Modeling” by Vitalis Wiens, Steffen Lohmann, and Sören Auer. “EARL: Joint Entity and Relation Linking for Question Answering over Knowledge Graphs” by Mohnish Dubey, Debayan Banerjee, Debanjan Chaudhuri and Jens Lehmann Mohnish Dubey presented EARL: A relation & entity linking for DBpedia Question Answering on LC-QuAD via Elasticsearch using fastText embeddings and LSTM. It proposed two fold approaches, using GTSP solver and connection density (3 features) classifier for adaptive re-ranking. “DistLODStats: Distributed Computation of RDF Dataset Statistics” by Gezim Sejdiu, Ivan Ermilov, Jens Lehmann and Mohamed Nadjib Mami Gezim Sejdiu presented DistLODStats, a novel software component for distributed in-memory computation of RDF Datasets statistics implemented using the Spark framework. The tool is maintained and has an active community due to its integration into the larger framework, SANSA. “Synthesizing Knowledge Graphs from web sources with the MINTE+ framework” by Diego Collarana, Mikhail Galkin, Christoph Lange, Simon Scerri, Sören Auer and Maria-Esther Vidal Diego Collarana presented the synthesizing KG from different web sources using MINTE+, an RDF Molecule-Based Integration Framework, in three domain-specific applications. Visualization and Interaction for Ontologies and Linked Data (VOILA 2018) Steffen Lohmann co-organized the International Workshop on Visualization and Interaction for Ontologies and Linked Data (VOILA 2018) for the third time at ISWC. 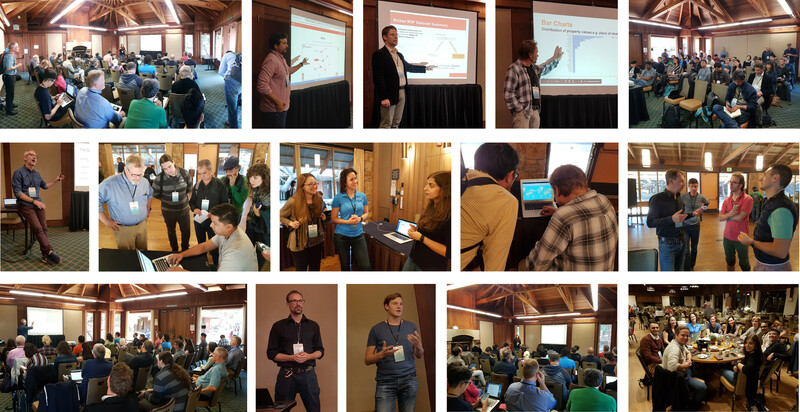 Overall, more than 40 researchers and practitioners took part in this full-day event featuring talks, discussions, and tool demonstrations, including an interactive demo session. The workshop proceedings are published as CEUR-WS vol. 2187. ISWC18 was a great venue to meet the community, create new connections, talk about current research challenges, share ideas and settle new collaborations. We look forward to the next ISWC conference. Until then, meet us at SDA!